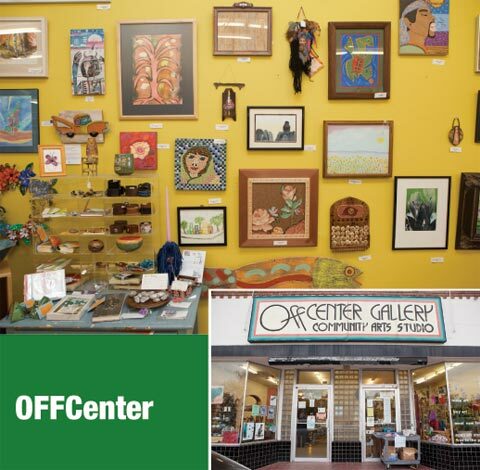 Hours: Tuesday through Thursday from 1 p.m. to 6 p.m.
Friday from 1 p.m. to 5 p.m.
OFFCenter is a community arts project that makes art available to everyone—whether you’re creating it or owning it. There is always a wide selection of hand-crafted gifts, including jewelry, paintings and sculpture on display. The latest shop offering is a line of products created from recycled packaging and bags that includes sketchbooks, reading glass cases, wallets, bowls, décor and bookmarks—all for $5 or less. Hours: Monday through Sunday from 9 a.m. to 7 p.m.
Nikki Zabicki is known for her iconic Burque belt buckles and has been selling them in local stores for years. Now, she and studio-mate J.P. Rodman have turned part of their space into a gift shop showcasing their wares and the work of other local makers. Get to The Shop to cross several people off your list with T-shirts, vintage clothes, jewelry, handmade housewares and, of course, Zabicki belts. Hours: Monday from 9:30 a.m. to 4 p.m.
Tuesday through Friday from 9:30 a.m. to 5:30 p.m.
Pre-created or custom-made gift baskets from Gift Baskets Just For You are the ultimate in last-minute gifting (especially for those out-of-towners). Stop by the storefront to view a selection of goodies like hand-painted cocktail glasses and picnic baskets on wheels. Or call and talk to Tina—she’ll be sure to get you the perfectly presented array. Hours: Monday through Saturday 12:30 p.m. to 5:30 p.m. This store is filled with items that make heartfelt presents. Give a string of Tibetan prayer flags to a friend and bring good will to all, not just the recipient. White Lotus also offers healing flags, jewelry, naturally dyed clothes and adorable knitted animal hats made in Nepal.